Photo credits: Douglas fir by Anna of A Thousand Turns. Abies koreana by Margaret Roach of A Way To Garden. Abies koreana ‘Silberlocke’ by Talon Buchholz of Flora Wonder. European larch cone by David McCarthy. Purple pine cones by Mark Preuschl. We planted a windbreak last year of Concolar Fir trees that are 5′ tall. This spring many but not all have small, upright, cones about the size of a ladies small finger. They are bright purple. We have never seen that color before although we have planted several hundred blue and green spruces, Douglas Firs, white pine, Australian pine in the past. Very pretty but wondering if this is a bad sign? The trees seem to be growing well this spring and healthy – although several (only 13 out of 54) were lost over the winter. Biggest problem we have had is getting a large root ball for these taller trees. Hello Lara, as this post illustrates, it’s not uncommon to see a wide variety of different colors when it comes to conifer cones. 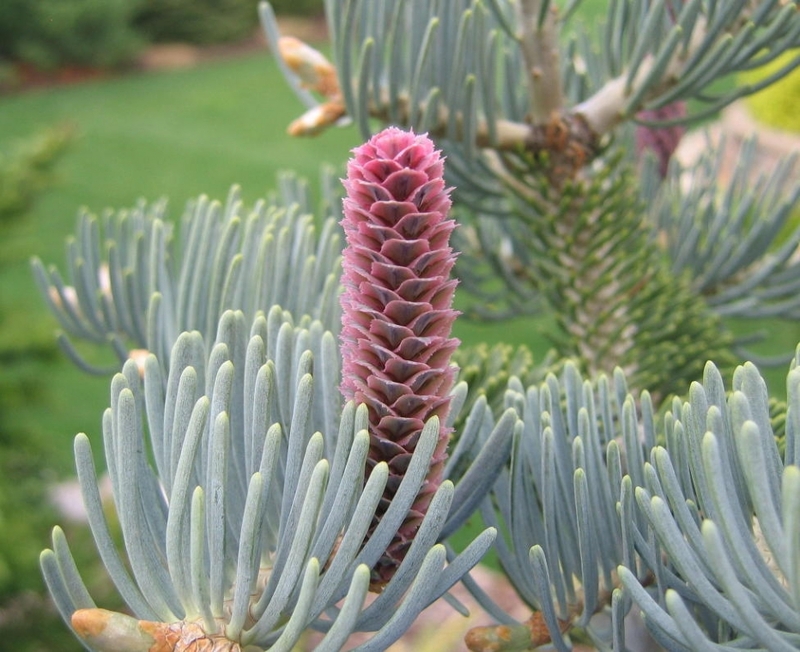 Abies concolar will first produce very slender, upright cones as you mentioned, which can range from a light grey-blue to a very vivid pink, as seen here. Typically, the color is most bright early in the season and later fades. Sounds like your trees are thriving and healthy, and I wish you the best success in your gardening endeavors!